Microsoft AI has won the maximum score of 999,990 points playing Ms. Pac-Man, surpassing the best human high-score record by four times. No human or AI has ever achieved this score. Yes, that is a big deal because those familiar with Ms.Pac-Man understand that it is a tough game. Katyanna Quach and Andrew Silver on Thursday in The Register noted Ms Pac-Man was a "rather tricky game," tough work for an artificial brain. How tough? "Computers can't play this game well since there are just too many possible game states to consider," they said. Allison Linn in the Microsoft blog discussing this Ms.Pac-Man feat quoted an associate professor of computer science at McGill, Doina Precup, who said that was indeed special. AI researchers use videogames to test their systems but, Precup said, have found Ms. Pac-Man among the most difficult to crack. The spotlight need at this point to turn to Maluuba, a Canadian deep learning startup acquired by Microsoft. They use something they call Hybrid Reward Architecture, a method parked under the umbrella of reinforcement learning. Their paper discusses the strategy. "Hybrid Reward Architecture for Reinforcement Learning" is up on arXiv. The authors are from McGill and Microsoft Maluuba, in Montreal. "One of the strengths of HRA is that it can exploit domain knowledge to a much greater extent than single-head methods," the authors wrote. "Instead of a single bot trying to singlehandedly complete the game, the problem is shared between up to 163 sub-agents working in parallel for an oracle agent. This central oracle controls Ms. Pac-Man's movements. When the oracle agent finds a new object – a pellet, ghost or fruit – it creates a sub-agent representing that object and assigns it a fixed weight. Pills and fruit get positive weights, whereas ghosts get negative weights." 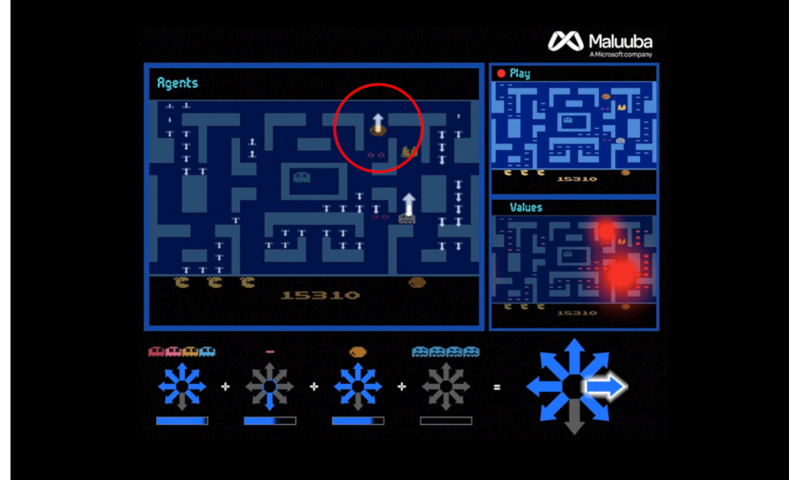 The oracle aggregates expected rewards from sub-agents; the information is used to move Ms. Pac-Man in the directions that maximize the total reward. All in all, Quach and Silver made the observation that the HRA is a proof of concept that did not have to learn the hard way. "It was born knowing everything it ever needed to know," said Quach and Silver, describing it as "a preprogrammed maze-searching algorithm." Hardcoded to solve Ms. Pac-Man, it may "be tough to adapt the design to other scenarios without starting all over again with another specialized model." Then why should we care? Allison Linn said their "method "could have broad implications for teaching AI agents to do complex tasks that augment human capabilities." Precup in the blog said that was similar to some theories of how the brain works, "and it could have broad implications for teaching AIs to do complex tasks with limited information."